Headlight switches & relays operations, in disgusting detail. This article was originally written (since then, expanded numerous times) because someone asked about potential problems with the left-hand switch of BMW Airhead motorcycles if using higher powered headlight bulbs. He did not understand why the existing stock headlight relay did not automatically take care of wear on the switchgear. The reason is that the stock headlight relay does not do what many think it does, at least on most, especially later, Airhead models. Variances of this question have come up many times, often on the Airheads LIST, but also on various other forums, and even for other BMW models. It is important to know that the main purpose of the stock headlight relay FROM 1978 is to turn off the headlight, leaving the dash lights and rear running lamp on, during the time the starter motor is actually cranking the engine. The stock headlight relay from 1978 does not switch between high or low beams. The relay switches the headlight off during cranking, and that's all. NOTE that the high beam flasher function remains, due to a separate green wire from the ignition switch, as a separate circuit. The headlight relay may or may not defeat, during engine cranking, depending on year, model, & country shipped-to. On some Airheads, the high beam flasher button (passing lamp function) MAY be available with the ignition off. It is a matter of where a green-colored wire goes to. It is easy to move a green wire at the ignition switch, and thereby have the ignition be ON, but the headlight OFF, in the PARK function, but there is more to this, and this is not the point of this article. Using additional relays to control higher powered than stock headlamps is a must; although some have gotten away with not doing so for years. Note that the left bars switch assembly is fairly expensive. It is not designed to handle higher-powered headlamps than the stock lamps, and it would have been, perhaps, better if a relay had been used by BMW in the first place, to handle all the current flow to the low and high beam. This is not difficult to accomplish, and such as the Eastern Beaver kit will do it easily. With the kit installed (or, your own two relays), the bars light switch(s) would only pass current to the extra relays COILS. This means that using accessory relays will reduce wear on the left switchgear even with the stock headlight; and usually will increase light output due to a more direct current path, raising the headlight voltage slightly. Sources for adding relays are any auto-parts store. However, www.EasternBeaver.com sells complete plug and play kits for your motorcycle, and they may even still have a version with a modulator if you wanted that. From beginning of the Airheads with the 1970 models, generally through 1974, the switches had black levers. The turn signal switch was on the right side, as was the start button. On the left side were the horn and lights. The 1975 models through 1978 models used flat rocker switches, and the kill switch was added. The 1979 models had flat switches, but the turn signal switch was moved to the left side. Monolever bikes switches had plugs with connectors, not spades. You might have different versions than I indicate above, and many old switch gear items are no longer available and thus there may be substitutions and even wiring changes. Some information is here: http://bmwmotorcycletech.info/misclelectrical.htm ...very specifically, see item (6) in that article on replacing a left side bars switch assembly on a /6. Versatile relays that can work fine for most functions on your motorcycle, such as switching lamps, running horns, etc., are the Bosch (now Tyco) 330-073, rated at 30/40 amperes and 12 volts, SPDT, 5 pin, with tab for screw (tab area can be removed); or the Blazer DF005 or DF005W which also has a tab/screw mounting. Similar inexpensive relays with DPDT, etc., are also available in these brands ....and many others. Some stock BMW headlight relays have a diode inside (some have two). The BMW relays are pricey. You can substitute, and add a diode if you need the instruments and keep-on running lamps during cranking. What follows below is an extension of article 24A http://bmwmotorcycletech.info/lamps.htm and is is a fairly complete detailed explanation of the headlight switching circuitry, the stock headlight relay, the diode(s) involved, etc. If you are the inquisitive type, you will want to read all the rest of this article; and, perhaps, as I suggest ...you will follow along on the schematic diagram for your bike. I will also provide a link to a simplified sketch/schematic for the 1981-1984, located on this website. The Headlight relay function was totally different before 1975; and changed to a new function from 1975 through most of 1978, after which it changed somewhat again. I will describe the switch and the relay usages below, but then I assume a 1979+ motorcycle (perhaps some of 1978).....up until I get into the 1981-1984 models. The /5 bikes (to 1973) had a plunger-pin "one plunger-pin key fits all bikes" type switch mounted on top of the headlight bucket. This 'peg-key' operated the internal switch that controlled lights and ignition directly, without a relay. In 1974, BMW retained that plunger type key switch, but it had 5 positions: OFF; Parking lights; Ignition only; Ignition and parking lights; Ignition and headlight. In 1975 BMW used a separate lights switch on the handlebar. BMW also added a headlight relay. Ever since, all USA shipped models have had a three position ignition switch, with a conventional type of key: OFF; Parking Lights; Ignition. From ~1975 to sometime in 1978 the headlight relay actually did directly control the headlight; the function of the relay was simply to reduce current through the bars switch in some situations, which it did obliquely, and even would enable a smaller switch assembly. The headlight relay did not bypass all the current at the bars switch.,....the headlights still had power from that switch, and not some headlight relay coil function from that switch. BMW never fixed that, or even tried to, until it changed the wiring (fully on the R100GS) with a load relay function. It is too messy to get into here. 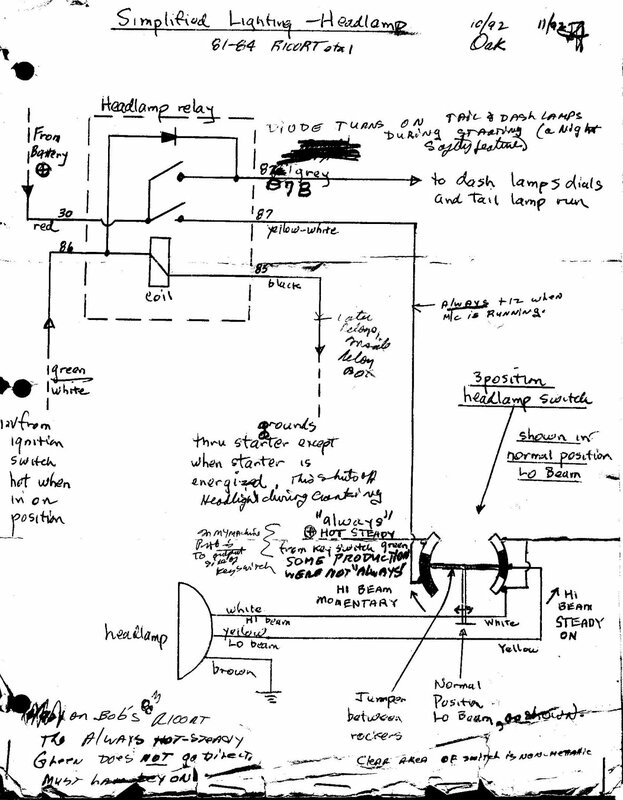 From sometime in late 1978 or early 1979, BMW used the headlight relay for other functions, and that, since it is a bit complicated, is what this article is primarily all about....but I also get into specifics for the 1981-1984 in Section 1, below, which is very similar to all later models. Note that eventually BMW added more functions to what originally was called the Headlight Relay. Thereafter, the wiring changed more, and the relay was then renamed as the Load Relay. 1. In the normal mode of the headlight relay, with the engine running; or, ignition on and starter not energized for cranking; the relay coil is energized. 2. The battery feeds two "arms' of the switch contacts inside the headlight relay. The connection for the battery to the relay is a red wire, and the associated relay terminal is #30. One of the contacts is touching contact connection 87b that has a grey wire. That gray wire goes to the dash (instruments) lamps and rear running lamp. A diode inside the relay keeps the dash and rear running lamps ON, during starting/cranking (more on this a bit later), as the diode is fed by a green/white wire from the ignition switch (terminal 86 at this relay), when the ignition switch is on. The diode is connected with its anode side to that terminal 86, and the cathode side is to that mentioned 87b (87B in the sketch). 3. The other relay switch contact also connects to terminal 30, but is touching the contact that connects to the yellow-white wire, which is terminal 87. This yellow-white wire is the one that supplies power to the headlight switch assembly on the handlebars. That assembly has the switch that controls hi and lo beams, but also has a momentary switch to flash-to-pass (or, just call it the hi beam momentary switch). A separate green wire (from the ignition switch) connects to that section of the switch, which allows the hi beam switch to work no matter the power (or not) to the headlight relay coil. See the sketch. 4. The headlight relay wire I have not yet mentioned is the black wire from terminal 85 of the relay. This wire connects to the starter motor. When the starter motor is engaged the starter has +12 volts on its solenoid terminal. If this same +12 volts is applied to both wires of the headlight relay coil (the other, as noted, at terminal 86), then the headlight relay coil has no voltage drop across it, meaning it de-energizes. The internal diode keeps the dash and running lamps on during cranking, but the headlamp is turned off by the relay. There is a minor complication that I will mention, since some sharp-eyed person might. There may be a second diode in this black wire circuit. It could be inside the relay (very late models), or elsewhere's. It's function is not important here, other than to mention that it prevents a situation where the system could become self-energizing. When the starter is not in cranking mode, there is no +12 volts at the starter, and the starter looks like a very low resistance load to ground, as far as the headlight relay coil is concerned. Thus, the headlight relay is energized, and the headlight is on. When the starter is energized, the relay coil is not energized, the contacts open, and the diode provides power to the dash and running lamps. Feeding the lights switch with power is the yellow-white wire from terminal 87; as previously noted. That wire is not energized when the relay coil is not energized. Thus, there is no power to yellow-white wire through the relay if the key switch is off. There are two versions of the Hi-Lo beams bars switch wiring to the headlight bucket and ignition switch. Your BMW owners manual schematic may well show the wrong one! It is not easy to find the schematics for both versions, to see side by side. One version allows high/low flashing without the ignition key being on, the other version turns off all lighting function possibilities (including the momentary flashing switch) if the key is not on. Both types have been shipped to the USA and elsewhere's! It is a matter of where a green wire from the headlights switch is connected. Usually, for USA-shipped-bikes, that green wire from the headlight switch assembly is connected to the output side of the ignition switch. Thus, the headlight switch has power. I have seen one other version, and am not sure it is stock. That Airhead was wired such that in the PARK position, all flashing functions were still available. This Airhead could have its ignition key removed in the Park position. Some folks have made a small wiring change, moving a single wire of the push-on type in the headlight bucket. This can enable the ignition to be on in the Park function ....which some can then use to energize a 10 watt quartz lamp to the headlight shell (side of the headlight itself) on the RT/RS, ....etc. This leaves the headlamp bulb itself not powered in the Park position. Thus, they can drive with a fairly bright headlight (10 watt quartz), and save 45 watts, for such as accessories or better alternator functioning, or call it better battery charging. I am not getting into that here, other than to mention it, as it may slightly confuse those trying to follow my wiring and explanations if they don't know about someone modifying their bike before they purchased it. It was somewhat popular to do this. 6. There are two sections to the headlight switch on the handlebars, and they are mechanically interconnected. This is a spring loaded switch in its down position. Up is constant high beam, middle position is constant low beam, and pushed downwards (spring loaded to go back up to mid-position) is the flashing position (as in flash-to-pass). That section gets power from both the relay terminal 87 (yellow-white wire) and the mentioned green wire going to the ignition switch. Thus in starting function, the flashing mode is always available; few know this, and the Owner's Manual makes no mention of this. The 'arm' of this side of that switch simply selects high beam momentary flashing mode (or not) ....but the electrical power to the headlight lamp itself, whether high beam or low beam, must go through this switch section. So, this is a switch section that does not appreciate you changing to a high power headlight lamp, as the current draw is excessive on such a lamp, hence the reason relays are needed, to avoid wearing out that on-bars switch, as the contacts on the switch are not massive. The headlamp lighting switch lower right hand corner of the sketch shows the switch resting in the Lo beam normal position which the center of the rocker positions. The switch is quite special, and there is an internal jumper between the metallic parts which are inked in the sketch as rather solid. The non-metallic part is an empty area. The jumper can be seen running horizontally from the left to the right rockers, across through the center point. In the Lo beam, the relay contacts are closed, and currnet leaves terminal 87 from the relay, to the switch left side, across the jumper to the right side to the inked-in area to the Lo beam yellow wire to the lamp itself. Note that the white Hi beam wire is disconnected entirely. Still looking at the sketch you downloaded and printed, if you swing the rocker clockwise as shown in the sketch, the inked-in part on the left side rocker allows steady all the time 12 volts to go ACROSS the switch internal jumper to the right side. At the right side the metallic part is now in the lower position and energizes the hi beam only, but does this using the direct from battery green wire. With this particular version, you can get momentary Hi beam, with the key out of the motorcycle, at any time. If you swing the rocker counter-clockwise as shown in the sketch, the left rocker segment STILL maintains contact with the yellow-white wire from the relay...but...the RIGHT rocker moves UP to the WHITE contact wire only, and thus illuminates only the Hi beam. This would be with the key on and the switch in the fixed Hi beam position. In this case, the 12 volts for the Hi beam must come from the relay, unlike the momentary position in which case it comes direct from the battery. This was done to avoid accidental steady-on Hi beam with the key off the motorcycle. This avoids someone playing with the bike while you are not there.....well, except for the momentary switch (if the bike was wired thusly). Measurements have been done that show that the Hi beam has a slightly higher voltage in the momentary flash position...there is less voltage drop in the system. The Eastern Beaver relays system eliminates that, and increases lamps output also, in all positions. Finally, if the diode in the relay SHORTS, a backpath of current, relay closed, can produce 12 volts to terminal 86 and 30, keeping the circuitry powered even if the key switch is OFF. This will result in you being unable to turn off the engine, until the battery was disconnected. This will repeat at the next start-up, so you must change the diode or get a new relay. 7. The other section of the bars switch also has the "I don't like high powered lamps" problem ...because ...this section receives all the power from the first section, via an arm connection in this bars switch ...and it is this other section that selects high beam, or low beam. Note that the flashing function is separate, and the headlight relay is not electrically in the actual function of the flashing portion, due to the two paths for power to the bars switch. 8. Thus, both sections of the handlebars switch must pass all of the headlight current. That is why the switch generally, but not always, tends to fail from use of higher wattage headlamps. 9. This is a re-said differently section of what is in 6. Rarely this has happened, but when it does, it will bug you as to the cause. If the diode in the headlight relay shorts, then the bike engine, once started and running, will stay running even if you turn the key off ...unless you either turn off the gas and wait awhile, or you stall the engine, or disconnect the battery ...and, of course, you will likely try moving the right bars KILL switch during this fun and games. The situation repeats after the next startup. Because diodes tend to fail from either electric current excesses ....OR, electric voltage spikes ....the diode, if it does fail in shorted mode, tends to happen during a starting attempt, as the starter motor produces prodigious amounts of voltage spiking during its use. THAT was mostly fixed in the last of the relays that incorporated a second diode. 86 = ground BUT CONNECTED TO THE BATTERY TERMINAL AT THE STARTER INSTEAD OF TO THE FRAME, so that when power is fed to the starter large terminal by the starter solenoid, it cancels the power coming into the relay via the 85 terminal, and kills the headlight. 1) Is this basically correct? 2) If so, what colour would the wire be to the starter terminal? Red, brown or something else? Terminals 85 and 86 are the relay's solenoid coil connections. On most relays, those are completely isolated and independent (Not so on later Airhead headlight relays ...see below; and the starter relay is also special). For common relays (not stock later headlight nor starter relay in Airheads), either 85 or 86 can be used interchangeably for coil power + or coil power -. The stock Airhead headlight relay on the later models incorporated an internal diode, and the way that diode was connected mandates that terminal 86 is the + from the output of the ignition switch (via a green/white wire); and 85, a black wire, went to the starter motor (last of the relays/bikes versions had a diode in that lead too). In the Airheads that do ground the relay to the starter hot terminal (well, really the solenoid hot trigger terminal); primarily the 1981+ models; as I said above, the wire to the starter that grounds the headlight relay coil is black, from terminal 85 of the headlight relay. That black wire, in the wiring loom, typically physically ends at the starter relay, NOT at the actual starter or starter solenoid. Electrically, it is the same place. Power goes from battery + to and through the starter relay (internal jumper, red wires) to the ignition switch ...all the time. When the key is turned ON, the headlight relay coil gets power to terminal 86. Terminal 85 is grounded (early models with headlight relay), or, goes to the starter motor via the starter relay connection point (later models with headlight relay). The starter relay connection point I am talking about is the the output of that starter relay. That starter relay output terminal is +12 only when the starting push button switch is pressed. When you press the starter button, that +12 goes, via a black wire, to the small terminal on the Starter Solenoid. That energizes the solenoid, and the starter hopefully starts rotating. Since the headlight relay then has +12 at terminal 85 & +12 at terminal 86, there is no voltage drop between them, and the coil of the headlight relay is not energized (during cranking). If you have followed all this, you will understand that when not cranking, but ignition is on, the headlight relay coil is energized, and you then know which contacts are closed! Very early Airheads (that had the headlight relay), had the relay GROUNDED via a brown wire. If I remember correctly, the transition year for wiring that headlight relay to the starter motor began with the 1978 model year, and a year later, in 1979, the diode was installed in the relay. There were some anomalies. If I remember correctly, the 1979-1980 R65 model did not use the diode and the relay went to GROUND, not the starter. Please refer to item #6 in the following article, it explains the headlight relay operation somewhat differently, and if you are having problems following all the above, using the bike schematic diagram, this might help you! 01/14/2008: Clarity; and same, again on 06/08/2011. 05/16/2012: Correct typo in #1, as terminal is 87b, not 87a. 10/03/2012: Add QR code, language button, update Google Ad-Sense code; add information on 1975 & prior controls & 1975-1978 relay function. 09/15/2014: Slight updating, strictly for clarity. 07/16/2016: Update metacodes, H.L., scripts, slight changes to fonts and layout. Clarify details (minor). 01/16/2018: Major revision. Reduce excessive html, fonts, colors. Layout improved. Clarifications in many areas. 01/21/2019: Updated, regarding the current path, etc., for the '75 to '78, due to a series of E-mails from Brook Reams (THANK YOU!!). There is also an error in the way the current flow is remarked upon in the Chitech electrics manual, on right side of page 42. 03/18/2019: Add link for the 81-84 wiring sketch, and modify the text, and clarify some previous details....particularly notable is the extensive descriptions now in #6.